I recently discovered your podcast by way of the Runner’s Connect Podcast you recently did. As “luck” would have it I’ve been having some mild (1 or 2 on a scale of 10) pain in the ball of my left foot, primarily below the 4th toe but sometimes I notice it below the 2nd and/or 3rd. I just finished listening to your 4 part series on pain in the ball of the foot. I particularly enjoyed the last one where you describe how each condition manifests itself. However, I became more confused when your detailed descriptions weren’t really anything close to what I’m feeling and seeing, so I went back to researching. I have an appointment with a sports orthopedic doctor, who has experience with foot and ankle issues, this afternoon and I was mulling over how I was going to describe my pain to her. The best way I came up with is, that it feels like the bones in the ball of the foot are pressing right against the ground (hardwood floors at home…ouch!) as if there’s no padding in the bottom of my foot. With that, a light went off in my head and I started researching again and discovered that the loss (atrophy) of the fat pads in the bottom of the foot is common, especially as we age (I’m 48). First of all Michael…thanks for sending this in! This is a great question and I’m really glad that Michael sent it to us. Because this isn’t something that many doctors discuss. What exactly is the fat pad? The fat pad functions a lot like the midsole cushioning material in your running shoe. It protection your skin from all that pressure and pounding when you stand, walk or run. Although it is made up mostly of fat it’s not just fat. The fat pad is very dense clumps of fat cells with lots of collagen woven into a web that holds it in place. When you cut through it in surgery the collagen fibers are very tough and it kind of reminds me of those plastic nets that they used to have around frozen chickens in the grocery store. Those nets of collagen hold the clumps of fat in place. Is a cruel trick old age is a simple fact that you can have atrophy of the skin in some places and increases in fat and others. So our skin can get thinner in some spots for doesn’t help us. Thin skin under the ball the foot is not really beneficial. I’ve heard a lot of podiatrists say that running causes atrophy of the fat pad. But the truth is there’s no true proof of that at all. There is some atrophy of the fat pad as a natural consequence of aging. But that doesn’t explain why some people can run their entire lives and others get fat pad atrophy. One thing we know for sure that can cause atrophy of the fat pad is injections of corticosteroids. 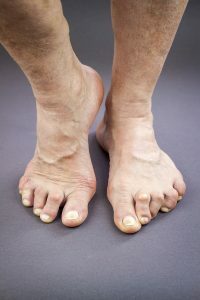 If you get a neuroma or a case of plantar fasciitis and a podiatrist injects your foot with Cortizone, you may have some atrophy of the fat pad. The corticosteroids can weaken collagen bonds and break up part of that fibrous web that holds the fat pad in place. The corticosteroids can also shrink the fat cells down. This does happen. If it happens to you it can be a real bummer. What can you do about fat pad atrophy in the ball of the foot? There are really 3 approaches to fat pad atrophy: decrease the pressure under high pressure areas, increase the pressure under low pressure areas or fat pad restoration. We’ll discuss them all. 1 . Decrease the pressure in the area that hurts. One way to think about pain and irritation in the ball of the foot is to consider the total amount of pressure applied to the foot throughout the day. You probably have the highest amount of pressure applied to the foot when you run. But what about when you’re walking around the home barefoot? If you happen to have hardwood flooring or tile flooring then you are probably contributing an awful lot of pressure and irritation to the foot when you’re just walking around your home. If you wear shoes in the home that have some cushioning you may decrease some of the irritation. Although this may seem like a waste of time because it’s not decreasing irritation when you’re running, you have to remember the pressures are all additive. The more pressure you apply to those structures in the ball of the foot throughout the day, the more irritated they will become. The more you irritate the ball the foot the more it’s going to hurt. If you wear cushioning type shoes when you’re walking around the home and considerably decrease the irritation while you’re walking around your home, you can probably run a bit further before the pain in the ball of the foot starts to bother you. Keep in mind the goal is to keep running as long and as far as possible. If you apply increased pressure and friction to the skin you develop calluses. The skin gets hard in an attempt to spread the pressure over a greater area. This usually happens under that heel or under the metatarsal heads at the ball of the foot. A little bit of tougher skin is usually a good thing. The problem is that sometimes the skin gets so hard did it actually increases the pressure. Sometimes the callus starts to form in a very small spot. The skin becomes hard. As you step on that skin, it gets pressed in to the ball of the foot. That is irritating so your body forms another layer of thicker skin on top of that. And then another layer of thicker skin on top of that. Over time you build up a cone shaped callus that is getting pressed into the foot. That thick part of the cone is toward the outside or toward the ground. But the pointy part of this callous is pointing into the ball of the foot. And it hurts! Corn on the foot. Foot sole with corn. Some people refer to these kinds of calluses as “seed corns.” Podiatrists call them all sorts of different things. You may hear the term “porokeratoma,” “IPK or intractable plantar keratoma,” or simply keratoma. If you go see a podiatrist and they discover you have these calluses, they will use a scalpel to trim them down. As podiatrists, would like to use scalpels simply because we are surgically trained and makes us feel like we’re doing something useful. But you don’t have to have surgical training or a scalpel to trim these things down. I have seen many patients you have successfully trim these things down themselves by using a pumice stone, and X-Acto knife or even a Dremmel. But for full disclosure and as a warning and disclaimer I cannot recommend use of a hobby knife or industrial equipment for the self-treatment of skin lesions. But all kidding aside, if you do anything to reduce the thickness of these tender calluses you will have decreased pressure under these areas at the ball the foot where you are getting the most discomfort when you run. That in itself may be enough to keep some people running without pain. Because it takes friction and pressure to build up calluses you may find it helpful to apply body glide or skin lubricant just to those areas where you’re getting the thick callous formation. This decreases the friction. If you can trim the calluses down a bit and then apply skin lubricant, it may take a long time before they come back. Since it also takes pressure to build up calluses you should try to decrease the pressure under those specific spots that are becoming painful. The very simplest way reduce the pressure is to reduce some of the material under that particular structure. Let’s say for example, that you have a thick callus forming under your fourth metatarsal head at the ball of the foot. If you take the insert out of your running shoe and you look at it you will see an area of wear, discoloration for surface erosions on the insert that show you exactly where your foot sits within the shoe. You’ll see little impressions for each of your toes as well as the bones under the ball of the foot. If you have a big callus on your fourth metatarsal head you’ll probably have a whole lot of wear and tear on the top cover of the insert within your running shoes. It just makes sense. If you’re wearing out the skin on the bottom of the foot under the fourth metatarsal head then you are also likely wearing out the top cover on the removable insert within your running shoe, in that particular spot. If you take a razor blade, X-Acto knife or even a pocketknife and you trim away some of the material on the bottom side of the insert under this area where you have most of the wear and tear corresponding with the fourth metatarsal head it will remove some of that material, decrease the pressure and consequently decrease the irritation to the fourth metatarsal head. You don’t have to remove a ton of material to make a difference. Again, just a small change in the amount of peak pressure can be the difference between forming calluses, or not and running with pain or running without pain. 2 . Shift the pressure away from where it hurts. The alternative to removing the pressure underneath the area of highest pressure is to increased pressure in other areas. It’s as simple principal of physics you cannot remove pressure, but you can move it somewhere else. And that’s the idea here. So instead of cutting away material underneath the area of highest pressures we simply add padding underneath the insert in your running shoe to spread the pressure to other areas they’re not as irritated. 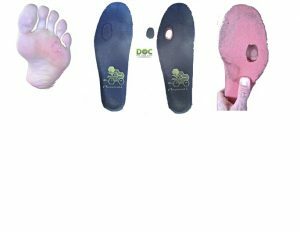 The most common way podiatrists do this is they will take a teardrop shaped metatarsal pad and cut out a small semicircular section at the end of the pad and place the modified pad under the insert in the running shoe. If it’s placed in the right position the metatarsal pad will spread the pressure to the necks and shafts of the metatarsals and the other metatarsal heads. Because it increases the forces to the neighboring structures you decrease the force to the one irritated metatarsal head. Custom orthotics are probably the most elegant form of customized offloading. We make a plaster mold of your foot. We create a custom orthotic insert for your shoe that more evenly distribute pressure. Of course, we can customize the orthotic to remove pressure from specific metatarsal heads or other areas of pressure, pain and irritation at the ball of the foot. Whenever a patient calls me and I think they may need custom orthotics, I most often try the simpler approaches that I mentioned before to make sure that offloading will be affective for them before I try to make expensive custom orthotics. Most runners do not need custom orthotics! 3. Restore or replace the fat pad. In an ideal world if you have lost of the fat pad you would just be able to fix it. And there’re couple of ways that we can attempt to do that. It just depends upon which problem you actually have. If you have hammertoes, the toes become crooked as they contract. As the toes contract they actually pull the fat pad up and shift it away from the ground. Because the fat pad is moved up out of the way into the sulcus between the foot and toes, you wind up walking on the metatarsal heads without the fat pad cushioning protecting the skin. This is extremely common in patients with rheumatoid arthritis. One of the simplest solutions for those patient is to make a large incision on the bottom of the foot, just behind the metatarsal heads. When we make the incision it looks basically like an inverted smile or a frown. When we cut out that smiley-faced shaped section of skin and sew it together it actually tightens up the skin and pulls the fat pad in the toes back into a more normal position. And just like that the fat pad cushion is restored. You now have the fat pad back where it belongs. A second approach is to simply take fat for someplace else and then inject it into the foot. The terms “lipo-“ means fat, and “auto-“ means it comes for you as the donor. So autolipotransplantation means that we take fat from one part of your body and transplant it into a different part of your body. There was a time when it was popular to take some of the fat out of your rear end and then inject it into the creases in your face. This is like a plastic surgery two-for-one special. You reduce fat you don’t want it and you put some fat in a place to fill the creases in your face that make you look old. This is a form of autolipotransplantation. We can apply the same procedure to the foot. We can take some of the fat cells out of another area through liposuction, and inject the harvested fat cells into the ball the foot to increase the cushioning. Some doctors do this in an office setting. The main drawback of this procedure is that the fact that your fat pad is not just fat cells. It’s actually this conglomerate of fat cells interspersed and held in place by collagen fibers. It seems to me that because the transplanted fat lacks the collagen component, the transplanted fat cells may not be as durable as the original fat pad. Your mileage may vary. An autograft is tissue moved from one part of your own body to another part of your body. And allograft is transplantation of human tissue into a different human. Allografts are commonly used for tendon and bone reconstructions. There have also been a number of different soft tissue transplant materials developed. These soft tissue graft materials are often used in reconstructive procedures for diabetic foot wounds. I have done many of these procedures myself. Allografts can be very durable. They can cause a considerable about of scarring, but that scarring collagen formation can provide some cushioning. Although it may not be as soft as your original fat pad cushioning, it is much better than nothing. Aside from the fact that it is from a donor and has a recovery time of 6 to 8 weeks, there are a couple of other downsides. This has to be performed in operating room, the procedure is much more expensive than others, and it has a higher risk because it is pure surgery. Injectable fillers have been used for more than 20 years. Crows feet, worry lines, and other creases in the face can be reduced. The plastic surgeon injects the line in the skin with materials that plump up the skin and push out the wrinkles. These procedures are performed every day in plastic surgery offices all over the country. It didn’t take too long before podiatrists started realizing that they could inject these cushioning materials into the ball of the foot to help augment loss of fat pad cushioning. This sounds like a great idea because it’s such a simple procedure. You can get the injection right in a doctor’s office, or even your living room during a house call. You don’t have to worry about the donor site healing. You don’t have to worry about infections or transmission of diseases from a donor. And healing time is very short. But there are couple drawbacks to these procedures. The first is that injectable dermal fillers are not covered by insurance so they can be relatively expensive. The second drawback is that it’s completely unknown how long the synthetic cushion may last. Although injectable dermal fillers are used all the time for the face, you don’t walk on your face. We don’t really know what happens to the synthetic injected material in the ball of the foot when you run on it for years. One approach that I often discuss with patients, which I don’t hear other doctors talking about very much is the potential of simply killing the pain at the ball of the foot. It is possible to actually remove the discomfort by killing off the nerves in the skin where you have the most discomfort. 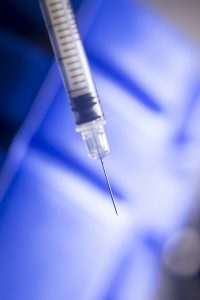 Podiatrists often perform alcohol sclerosing injections commonly to destroy nerve. In fact, this can be a great alternative to neuroma surgery. This is a series of weekly injections that will demyelinate the nerve and cause it to wither away and die. With no nerve, you get no feeling. If you have no feeling you have no pain. In the end you get a small area of numbness at the ball of the foot in the area innervated by the nerve where you had the alcohol injection. So if you have atrophy of the fat pad and you inject the area with an alcohol solution, it can destroy the cutaneous nerves, decrease the pain and allow you to continue to run. Although this may sound like a great idea to a lot of runners, you have to understand that alcohol schelrosing injections should be very carefully considered. Let’s just go back to the diabetic foot problem we mentioned when we were talking about the allograft augmentation. Diabetics lose the feeling in their feet. Because they can’t feel pressure or irritation they keep walking in the same way that keeps irritating the skin in the same way. It doesn’t hurt, so they don’t limp. Eventually they can wear a hole right through the skin on the bottom of the foot known as a “diabetic foot ulceration.” Diabetic foot ulcerations are the leading precursor to a diabetic leg amputations. Obviously, that sort of problem is not one that would help you run farther for long. So think twice if your doctor recommends an alcohol injection to decrease the pain under the ball of foot. Get a second opinion! The last approach is one that I’m only going to talk about very briefly because I don’t think it makes sense for the overwhelming majority of runners maybe listening to this. I mention this mainly as a warning. Your doctor may recommend this is a real treatment option for you. All foot and ankle surgeons are trained to look for ways to correct deformities. In some cases that means that we actually reconfigure your skeletal structure. We may realign bones and joints in an attempt to reduce discomfort and increase function. As a general idea, this sounds like a wonderful thing. But you have to keep in mind that as a runner surgery is about the worst possible thing that could happen to you. Surgery is invasive. It doesn’t always work. After you have surgery the rules change because your anatomy is different. And it’s virtually impossible to undo most surgical procedures. Surgical offloading means that we realize you have wait too much pressure on a particular metatarsal bone at the ball of the foot. So we do something to remove that pressure. 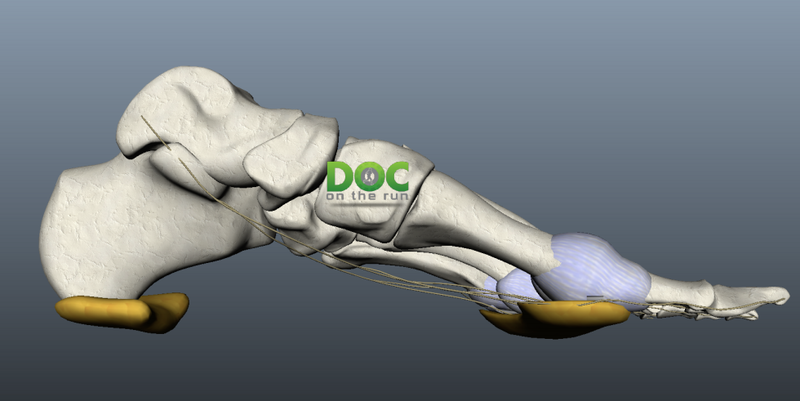 One approach is to actually shave away the material at the bottom of the metatarsal head. This is basically the same approach as shaving away the bottom of the insert in your running shoes. But obviously this is a much more drastic approach. A second approach is to cut the metatarsal bone and tilt it up so it doesn’t have as much pressure against the ground. The third approach is to simply make a V-shaped cut through the bone that allows the end the metatarsal to float upward. The V-shaped cut keeps the bone from rotating out of position but it allows it to slide up and down. Foot and ankle surgeons are commonly taught this procedure in an attempt to offload the bones of diabetic patients who are forming ulcerations in the foot. This basically means that the diabetic patient can’t feel the ground and so they’re simply wearing a hole right through the bottom of the foot. A lot of times when doctors do this procedure they will simply make the V-shaped cut and then sew up the skin. If they let the patient walk on it and assume that the bone will seek the appropriate level and then heal in the correct position. But this makes no sense at all for runner. Surgical offloading is sometimes appealing to runners just because it seems like a surgeon could go in and fix the problem. But there is no particular formula which doctors will agree upon. There’s no way to guarantee you’ll have success. You’re really only guaranteed two things: a bill and a scar. Although most runners are very solution oriented and really want to find a true fix for the problem, you have to realize that you don’t need to have a total restoration of the fat pad in order to keep running. If you think about this, just a few years ago you’re probably running without any pain at all in the ball of the foot. yet, even just a few years ago, you probably had some fat pad atrophy. The fat atrophy is usually progressive, but gradual. So it seems reasonable that if you can just get back to that level of cushioning of a few years ago you should be able to continue to run. That may mean that you all need is a very modest increase in comfort to keep running. You don’t need the body of a 20-year-old to run faster than a 20-year-old. You just have to be able to run without pain. Try the simplest solutions first. Most of these you can try it home, without ever seeing a doctor. Experiment. Try several different types of padding. Try different forms of offloading the areas of highest pressure. Even if that doesn’t work, the information that you discover through this process of experimentation will help your doctor determine whether or not any of the more invasive, riskier solutions might actually help you. Above all else, when you talk to your doctor about this, make sure she understands your goal is not just to get rid of the pain…your goal is to keep running!